basically a Lisa Frank sticker book realized in nail polish. It contains a rainbow of assorted translucent neon hexagons with translucent white squares, stars, moons, hexes and hearts in a blue-violet-shimmered base. Accented with iridescent blue sparks. In order from my index nail to pinky I used 2 coats of Sinful Colors Sweet Tooth, Cotton Candy, Sugar Rush and Unicorn with 1 coat of A Unicorn Walks into a Bar... and a top coat of Seche Vite. Man Candy is made with assorted cyan glitters with a sprinkle of translucent purple hexagons all in a shimmering turquoise base. I used 2 coats over 2 Sinful Colors Sugar n Spice and top coat of Seche Vite. 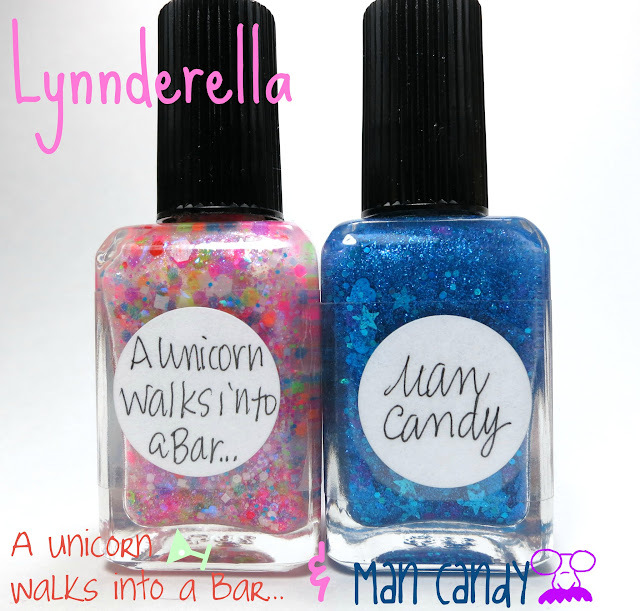 You can purchase Lynnderella polish on eBay by going directly to Lynnderella.com. Be sure to follow all the Lynnderella fan pages on Facebook, Twitter, Instagram and Tumblr. For any international ladies looking to purchase some of these beautiful polishes, you will soon be able to from Norway Nails. Make sure to follow Lynnderella's blog and Norway Nails on Facebook to stay up to date on when they will be stocked.